In a recent petfinder.com survey, our shelter and rescue group members reported that older pets have the hardest time finding homes. It’s a sad reality that these great animals are often the last to be adopted from shelters. However, November is Adopt-a-Senior-Pet Month and we hope, with your help, to improve the adoption rate for older pets by spreading awareness about how great senior pets can be. Older pets are typically calmer than puppies and kittens, often content with a more relaxing day-to to-day routine. As we all know, puppies and kittens, though very fun, are often more rambunctious and may find themselves getting into mischief when they get bored. 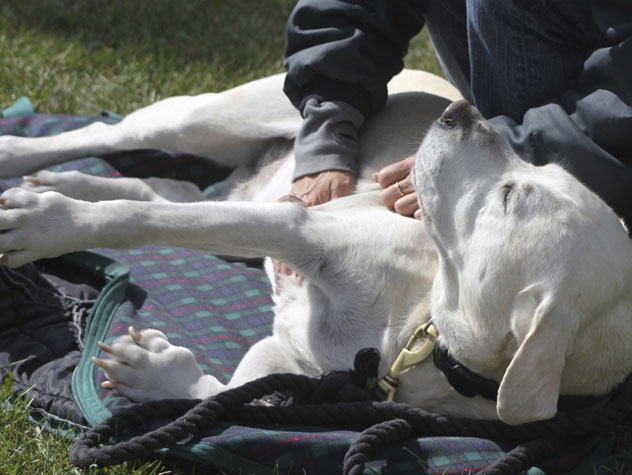 The low-key, mellow nature of older pets makes them a great fit for households with children. Before ending up in shelters, senior pets often come from some sort of family life which makes adjusting to a new home environment much easier than it could be for puppies or kittens. Senior pets are often already trained and may even be pros at performing basic commands. The great news is that even if they’re not, they are much easier to train than younger animals. Their experience around humans, along with more established physical and mental abilities, allow them to better understand the requested commands and pick up new tasks much faster than puppies or kittens. Unlike young pets, senior pets are not a 24-7 commitment. Many new pet owners underestimate the time and commitment it takes to properly train a new puppy. Because of their relaxing lifestyle, senior dogs they also don’t require the constant attention and exercise that comes with young pets. Of course, they still love to play with the family, they just don’t require as much of your focus and energy. With senior pets, you know exactly what you’re getting. Senior pets’ personalities are already developed so you can tell right away if they will be a good fit for your family. Even things like their size, energy level, and health status are already established so you know exactly what to expect with your new pet. Story after story suggests that senior pets are especially grateful for their new home. They seem to know they’ve been rescued and owners often notice an extra special sense of love and appreciation from their senior pet. The list can go on and on, but most importantly, when you adopt a senior pet, or even share knowledge about the need for senior pet adoptions, you are truly saving a life. We, on behalf of all the shelters and senior pets out there, thank you for that. Share a Happy Tail story. Add a senior-pet search widget to your Web site or blog. Post a photo of your senior pet (and tell us why he or she rules) on our Facebook wall. Adopt a senior pet for Adopt-A-Senior-Pet Month.